The T-style and Biesemeyer fences are probably the most popular table saw fences, but to build one requires a welder, cutting torch, square tubing, angle iron and a locking mechanism. If you don't want to go to that trouble, a very workable table saw fence can be built from a few strips of plywood and a pipe clamp. This fence can be a little tricky to position, but once it is locked in place, it isn't moving. 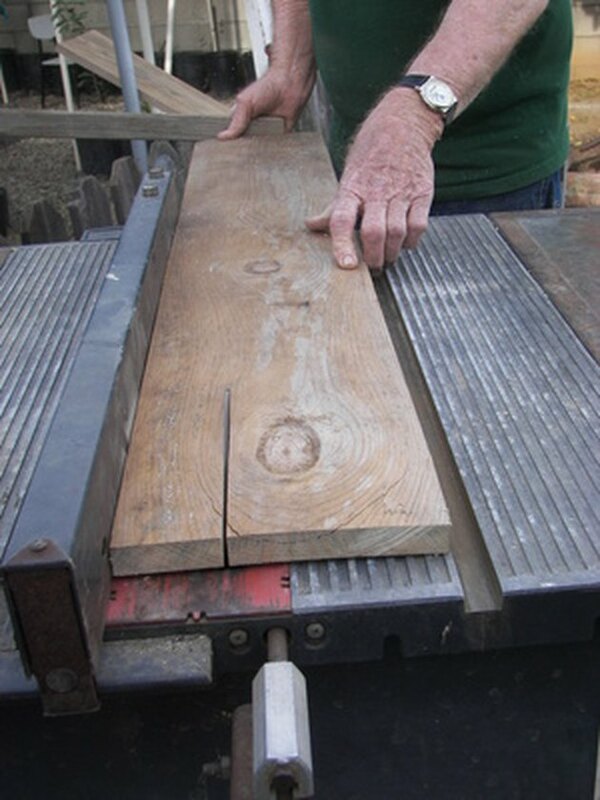 A table saw is ideal for ripping long strips off a board. Measure the distance from the front of the table saw's table to the rear of the table. Set up the table saw, and rip two strips of plywood at 4 inches wide, then another two strips 2 1/2 inches wide. Cut the four strips to the same length you determined in the previous step. Finally, cut two small pieces of plywood 2 1/2 inches square. Drill a 1-inch-diameter hole in the center of each of the two small squares of plywood. Assemble the four strips of plywood into a long square tube, 4 inches on each side. The 2 1/2-inch strips should be fit between the two 4-inch strips. Connect the four strips of plywood together with a deck screw every 6 inches on each side. Insert one of the small squares into each end of the square tube, and affix to the tube with deck screws. Attach the crank-end of the pipe clamp onto one threaded end of the 3/4-inch pipe. Insert the open end of the pipe through the square tube, then attach the back end of the pipe clamp onto the pipe. Place the fence assembly onto the table saw to the right of the saw blade, with the crank end at the front of the table. Position the jaws of the front and rear clamp onto the edges of the table, then crank down the crank handle on the front of the pipe clamp to tighten the fence to the table.